There’s one thing that stands between you and reaching your goals: time. 1. Time-box writing your first draft. During that time, aim to write as much of the email as possible without stopping and editing as you go. The goal is to complete a first draft of your email content within this time frame. By doing so, you allow yourself to get all of your thoughts out on paper (or computer) – without getting hung up on perfecting the way you’re saying it. In the book, Everybody Writes, author (and Chief Content Officer at MarketingProfs) Ann Handley explained the pros of writing “The Ugly First Draft.” For many writers, the struggle isn’t necessarily figuring out what to say, but overcoming the initial barrier of writing something for the first time. More often than not, we expect brilliance with the first strokes of a keyboard or pen – which is never the case when it comes to good writing. And that’s why committing to getting the first draft – as hideous as it may be – out there into the wild is an important step to writing more efficiently. Even though it will be filled with incomplete or run-on sentences, grammar errors, spelling disasters and hierarchy problems, you’ll be better off having established a starting point. Once you have a first draft that you can review holistically, editing and revising your work becomes easier. And that brings us right to my next point. 2. Review, edit, write. Repeat. This is the time when you can bring clarity to what you wrote the first time, check it for accuracy, refine your call-to-action, confirm it adheres to proper spelling and grammar rules and so on. Hierarchy of information. The information included in your email should build up to your call-to-action. Spelling and grammar. This goes without saying, but ensuring your content abides by proper spelling and grammar rules is a non-negotiable. Plus, it helps you appear more trustworthy. Clear call-to-action. In most cases, your email should have a clear action for your subscribers to take. Correct links. Add any links (along with UTM parameters for advanced tracking) that will be necessary when building the email. Voice and tone. Your email content should align with your brand’s voice and tone. Does it convey and elicit the right emotions/feelings/attitudes? The “What’s in it for me?” question. Every email you send should bring some value to your subscribers. If you can answer this question within your email, it should pass the test! Character limits. For your subject line and preview text, make sure you don’t go past your character limit (we recommend using subject lines no longer than 50 characters). 3. Don’t reinvent the wheel – use proven writing frameworks. If you have your writing and editing process down, there may be other ways you can quicken the overall email creation timeline. One tactic I often use is based on how I structure the content within my email. For almost every message, I follow a framework commonly used in journalism (and some online writing): the inverted pyramid. According to the inverted pyramid, the content you write should have the most important information (i.e. your main point) at the beginning, with less salient information (or supporting, more detailed content) towards the bottom. I love this writing style for online content like emails, because it’s perfect for the many people who either skim what they read or only read the beginning of a piece. This ensures what they do read is the most important, explains the value of the email and directs to the call-to-action. Then, once you’ve shared all the information a reader needs to know, you can add more detail later on. 4. Start with direct questions from your subscribers. Struggling with brainstorming ideas for your next email? One source of inspiration lies within your customers and subscribers. Whenever you receive questions or feedback from your audience, log those in a notebook or document file on your computer. This can become a pool of future content ideas you can use to craft your next blog post, email, video, podcast or all of the above! The best part of all is that you’re directly answering questions and resolving real problems you know your customers have – so there’s no denying the value your business provides. In the very first sentence, Veronica addresses the fact that she knows her readers have been asking a lot of similar questions about the cooking tools she uses. By framing up the email this way, she hooks in subscribers who fall in this bucket. Then, she shares that she has provided the answer in a new post and includes the link at the bottom. And yes, it’s as simple as that! 5. Keep your content concise. You don’t often hear that shorter is better, but that’s often the case when it comes to email. One benefit of drafting email content is that you’re not required (or expected) to write a lengthy piece. All you have to do is get your point across in a way that’s subscriber – and benefits – focused and include a call to action. Now I know this can be easier said than done. You have tons of great things to share, and you may be tempted to fit it all in one email. If that’s the case, my recommendation is to try sticking to one main call-to-action (CTA). This will make it easier for you to write your content. It also makes it easier for your subscribers to take action. Too often, we find that the more CTAs there are, the more confusing it can become for your subscribers. The more friction you create within the experience readers have with your emails, the less likely they are to do anything at all. Instead, focus on one goal and creating content that supports it and urges subscribers to take action. Instead of trying to make a point in three to five sentences, can you do it in one or two? Instead of expressing a phrase that is five to seven words, can you find a shorter phrase or word that helps you condense it to one or two? Are there any redundancies in your content that can be cut out altogether? By making your writing more concise, it can also increase readability of your emails. 6. Stop writing in complete sentences. Now, I’m not advocating abandoning proper and basic grammar rules like complete sentences. What I do mean is that there may be opportunities for you to use different formatting styles like headings and bullet points to shorten your content. By doing so, it helps cut back on the time spent writing your emails. It also helps break up large chunks of text, which can be cumbersome to read in an email. Different headings (H1s, H2s, H3s) come in handy as they allow you to communicate main points within your email. They also replace transition sentences between different points in your message, which can require one to two sentences of content. Bullet points are helpful for when you want to make a list; whether that’s to highlight the many benefits of your latest product, features within an exclusive promotional package, helpful resources and more. Again, using bullet points help you write more quickly, and are more easily scannable for subscribers. The bullet points work perfectly in this situation because there is a list of benefits the reader will attain by attending the webinar. While we could have listed them out as a standard sentence, there was a chance it would have gotten buried within the content. The bulleted list is easier to read and skim and adds more emphasis to the value. If you’ve been building a significant content archive for longer than a year, chances are you have some excellent material that isn’t getting the traffic it deserves. Repurposing or re-sharing evergreen content you’ve published in the past is a great way to fill in content gaps in your calendar or brainstorm sessions. If you plan on repurposing content, a simple first step is to just re-share original links to what you already published. I also encourage you to explore ways to take new angles on what you already wrote. Or, bundle up a variety of content pieces that have a similar theme and present them as one new entity (like a round-up post). Either share it on your blog and use that to share in your next email, or offer it as exclusive content within the email itself! Since we received a lot of positive feedback from our customers, it made sense that when the holidays came around in 2016, we decided to replicate that success by creating new GIFs and promoting them in an email. We also optimized the email from the previous year by adding links to the GIFs in the headline and animated GIF. The result? We had a X increase in opens and X increase in clicks. 8. Stick with what works. If there are certain processes or elements that you know work for you and your subscribers, stick with them! As they say, if it isn’t broken, don’t fix it! There’s no harm in continuing with what works, especially if that means you have an engaged audience and aren’t bogged down by creating regular emails. If you enjoyed these email content tips, awesome! I hope you found one you can apply to your next send. 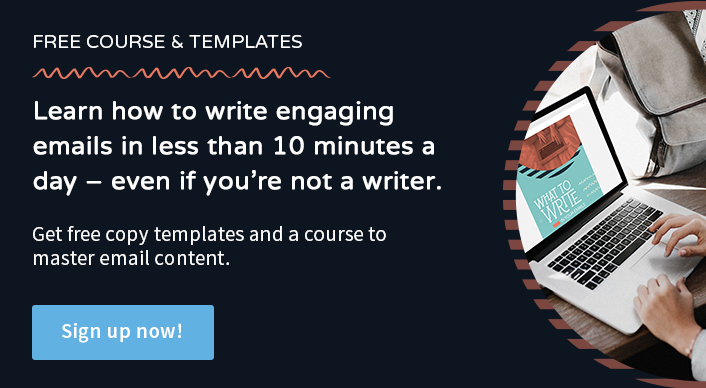 I’d also encourage you to check out our free What to Write in Your Emails course and guide, complete with 45+ fill-in-the-blank email templates! Learn to write quality emails in less time. Ann Handley is absulutely spot on when she says that the biggest hurdle is not lack of content , but that the biggest barrier is putting down in writing for all to see . It is damn right frightening to expose your opinion to the world and we are all afraid of criticism. I loved Monica, good writing is indispensable in an email marketing strategy. I will recommend this article to some friends.